Mr. Thomas Day was the reputed father of the dwarf family, and exhibited himself as small enough for a great wonder; as he was. He was also proprietor of the show; and said he was thirty-five years of age, and only thirty-five inches high. He fittingly descanted on the living personages in whom he had a vested interest. There was a boy six years old, only twenty-seven inches high. The Wild Indian was a civil-looking man of colour. 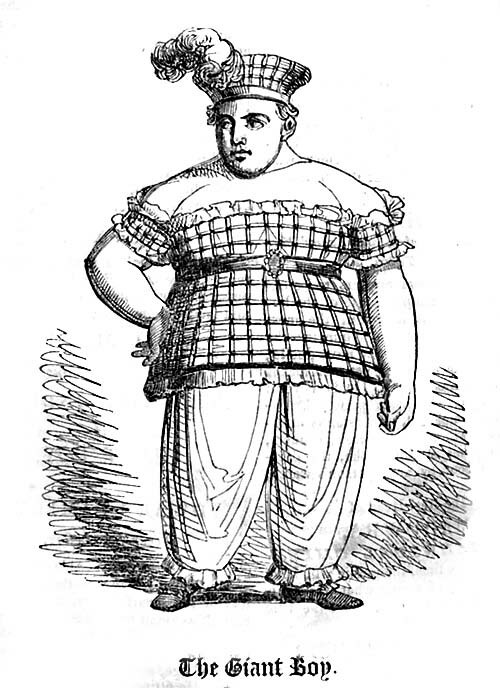 The Giant Boy, William Wilkinson Whitehead, was fourteen years of age on the 26th of March last, stood five feet two inches high, measured five feet around the body, twenty-seven inches across the shoulders, twenty inches round the arm, twenty-four inches round the calf, thirty-one inches round the thigh, and weighed twenty-two stone. His father and mother were "travelling merchants" of Manchester; he was born at Glasgow during one of their journies, and was as fine a youth as I ever saw, handsomely formed, of fair complexion, and intelligent countenance, active in motion, and of sensible speech. He was lightly dressed in plaid to show his limbs, with a bonnet of the same. The artist with me sketched his appearance exactly as we saw him, and as the present engraving now represents him; it is a good likeness of his features, as well as of his form. Above Excerpt from a visit to the Bartholomew Fair. 1825. On this day, Monday the 5th, the Fair was resumed, when the editor of the Every-Day Book accurately surveyed it throughout. From his notes made on the spot he reports the following particulars of what he there observed.